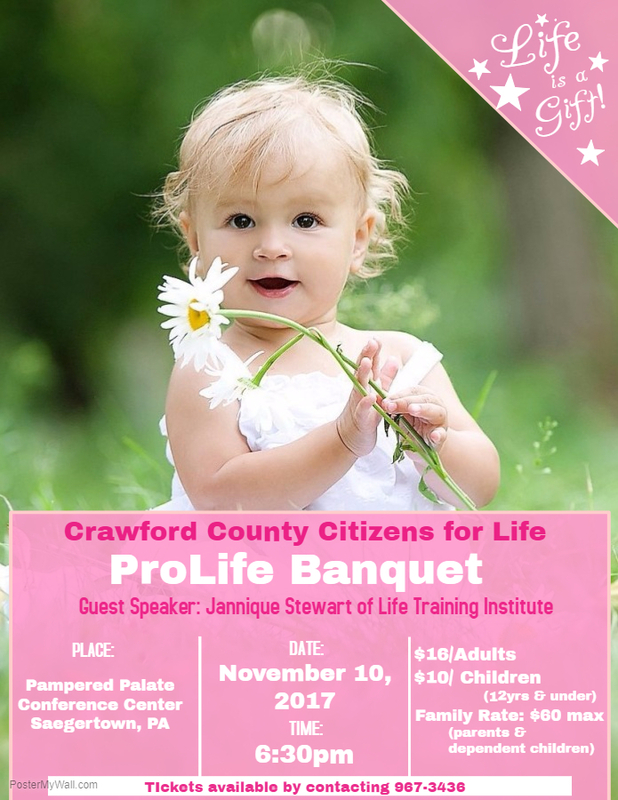 Crawford County Citizens 4 Life News Blog | Committed to affirming the intrinsic value of ALL life. Committed to affirming the intrinsic value of ALL life. Click on pictures to download files. April 30, 2016 will be the Pro-Life Workshop from 9:00 a.m. to 1:00 p.m. at St. Paul’s Reformed Church, 1070 Park Ave, Meadville, PA. Mike Spencer of Life Training Institute will help us develop skills in presenting the pro-life position. A light lunch will be served. Cross Display – CCCL will put up our Cross Display again this year. For more information about the display contact Merv Sommers at 814-425-3692 or email Merv @ msommers@zoominternet.net when you would like to have these displayed. We install them with a large sign explaining the Crosses. Any churches or private homes in high traffic areas are most welcome to display them. Most places keep them up about a month. August 20 – 27, 2016 is the Crawford County Fair. CCCL has a building at the fairgrounds. There are three, 4-hour shifts each day. Always at least two people on each shift. Any new volunteers can choose whatever shift they want and are put with “seasoned workers” their first time. Training was available in April to help us be better prepared to interact with fairgoers. There will be a schedule sent out to all membership in July 2016 showing workers and shifts from 2015. This will be a start of setting up the 2016 schedule. Even though we have a building we’re working in, we are required to pay to get into the fairgrounds. 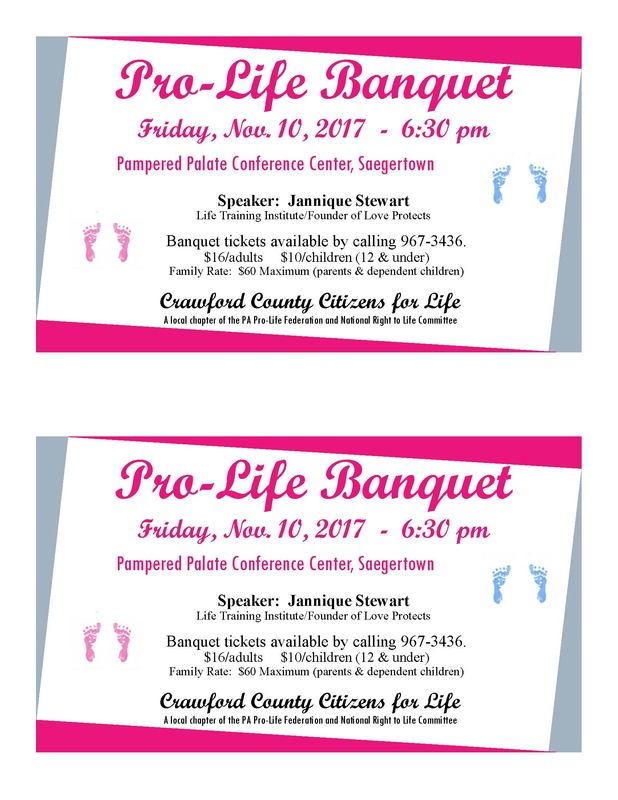 November 11, 2016 is the “tentative” date for our tenth annual Pro-Life Banquet again being held at the Pampered Palate in Saegertown, PA. We are currently seeking a speaker of which we have two to contact with the expectation of confirming one of them for the 11th. There is need for ticket selling, advertising, ushers, parking attendants, help in setting up and attending a table with CCCL’s resources that are free or a donation. January 27, 2017 is the March For Life in Washington, DC. Because of the Presidential Inauguration the weekend of January 22nd, the March has been scheduled for the following Friday. This date is put into 2016 because planning for it begins in December. Buses leave from Valesky’s Store and St. Agatha’s Church on the evening prior to the March. There will be future information on this as the event draws closer.